AllegroMedical.com presents The Sliding Shelf Caddy. 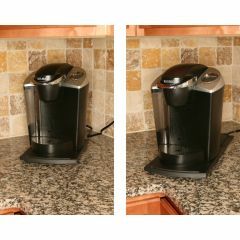 This sliding caddy is great for use with coffee makers, blenders, toasters, food processors and more! When closed, the Rolling Appliance Caddy looks like an unobtrusive stand. But when you want to use your small kitchen appliance that's tucked under the cabinet, this shelf makes the appliances slide out with ease. Coffee maker not included.